Spoiler alert: Do not read until you've watched "Keep on Trucking," the series premiere of "The Conners," ABC's new spinoff of "Roseanne." Thanks to a combination of a wildly public meltdown, ABC's subsequent "wait and see!" 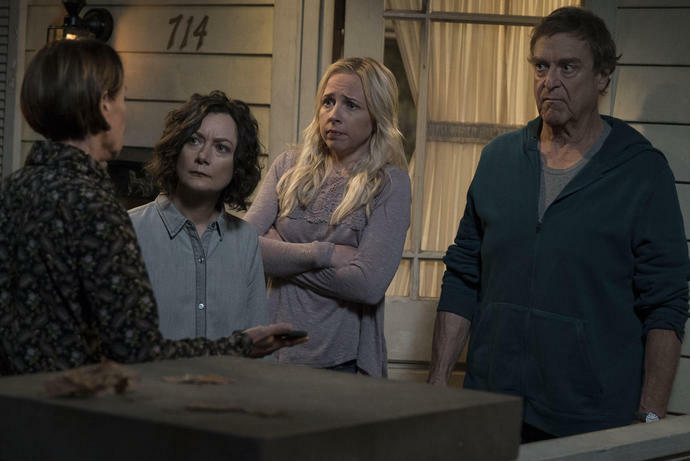 publicity effort, and just plain morbid curiosity, the question of how "The Conners" would deal with Roseanne Barr's exit from the new spinoff has been the biggest of the fall TV season. Of all the reboots and revivals on air, "The Conners" has had the strangest journey to screen by far. Just six months ago, "Roseanne," despite (or perhaps thanks to) star Barr's high profile, noxious political beliefs, dominated ratings. Onscreen, Roseanne and her family struggled to reconcile their political differences and the everyday realities of barely scraping by; off-screen, multimillionaire Barr was peddling right-wing conspiracy theories and hate speech online and beyond. When she tweeted something that finally pushed ABC to cut ties with her, the subsequent announcement that the show would live on without her as "The Conners" was both intriguing and confusing. How would the show continue without the character it had revolved around? What's more, the episode soon details, Roseanne didn't actually die of the heart attack they thought she did, but an accidental opioid overdose. This isn't exactly a surprising outcome; many, including Barr herself, suspected as much thanks to a storyline in the revival involving Roseanne getting a little more dependent on the pain medication for her knee than she, or anyone else, quite realized. "The Conners," to its credit, doesn't take this turn lightly. When Dan (John Goodman) finds the hidden bottle of pills that seem to have been the breaking point, he goes scorched earth on the woman whose prescription they belonged to by taping a sign to his car that calls her, and what he thinks she did, out by name. But when Marcy herself (played by surprise guest star Mary Steenburgen) shows up on their front door, he's forced to realize that the situation is far more complicated than Roseanne simply taking a few too many. As Marcy tells him through tears, she and Roseanne weren't just friends, but part of a group of neighbors who tried to help each other out when prescriptions were simply too expensive for them to afford, with or without insurance. "I would never have given them to her if I knew she had a problem," Marcy says, because she "know[s] what it's like to have that problem." It's also an example of how "The Conners" can keep up the "Roseanne" revival's commitment to being More Political without knocking the audience over the head with Fox News versus MSNBC talking points. Though it (like just about everything these days) has been politicized beyond recognition, the opioid epidemic is a pressing catastrophe that largely affects working class people across party lines and deserves far more attention - which makes it exactly the kind of issue that "The Conners," going forward in its brave new Roseanne-less world, can and should address. "The Conners" airs Tuesdays at 8 pm on ABC.